This latest installment of the X-Men saga acts as a joint sequel to 2006's X-Men: The Last Stand, 2011's X-Men: First Class and last year's The Wolverine. Jeez. 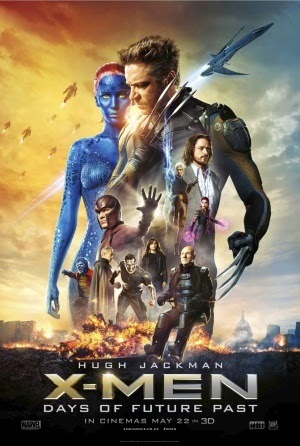 To unite these different narratives, a time travel plot is put into action - when the Mutants face extinction at the hands of the villainous Sentinels, Wolverine (Hugh Jackman) must journey back to the past to unite the younger X-Men and save the future before it even begins. The journey though time means we see both the young and old characters from the original trilogy and rebooted First Class series. Patrick Stewart and James McAvoy return as Charles Xavier, while Ian McKellen and Michael Fassbender portray Magneto. Jennifer Lawrence also reprises her role as Raven / Mystique, who is integral to the film's narrative. Supporting characters are played by a range of newcomers and reprisals, including Halle Berry, Nicholas Hoult, Evan Peters, Kelsey Grammar and the ever so charming Peter Dinklage. For the most part, the tricky narrative carefully constructs itself to avoid any serious plot holes or conflicts in logic. The pacing is spot on and everything keeps moving forward to the benefit of the story - almost never does it feel like the plot has taken a back seat to bloat the run time. Things do get a bit convoluted towards the finale, but in general the script is superbly written. All this is topped off with some superb action sequences, especially the climax which creatively combines set pieces in the past and future eras. The performances are generally fantastic, particularly Jackman as Wolverine and McAvoy as a troubled young Charles Xavier. Though his role is small, Evan Peters is notably exceptional as Quicksilver, who ends up being a neat heroic addition and a delightful source of comic relief. The balance of humour and seriousness is flawless, creating a film that doesn't feel too depressing but still has serious themes and high stakes. It all comes together to make the best X-Men film yet, which is really saying a lot following the stellar First Class.